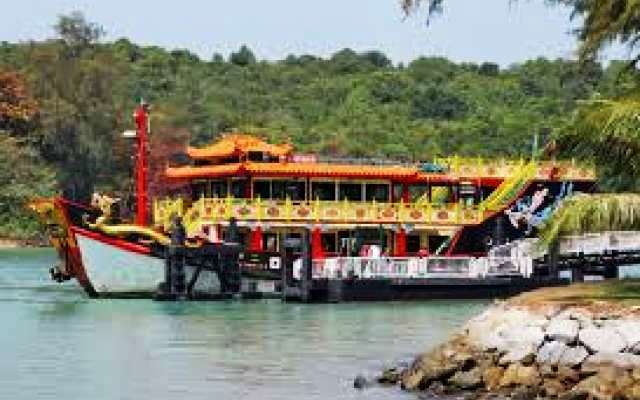 Kusu Island is one of the most eye-catching islands in the Southern part of Singapore. It is located around 5.6 kilometers south of the main island of the country. The literal meaning of Kusu means "Tortoise" or "Turtle" in Chinese. The island is also known as Pulau Tembakul or Peak Island in Malay. There is a wonderful story behind the formation of this wonderful island. The story says that to save two shipwrecked sailors one giant tortoise enlarged its body and finally turned itself into a wonderful island. To show their gratefulness, both the sailors returned to this island and finally established their set up here. The story goes equally in both Malay as well as in Chinese. Following this myth, a Taoist Shrine as well as a Muslim kramat was built on the island. Now days, people often visit the place to worship and to offer thanks to the God. The tradition of offering thanks and prayers on the eleventh month of the lunar calendar gives birth to an amazing festival here. In fact when the festival takes place here, that season is also known as Kusu" season. The island now houses a wonderful Chinese temple called Da Bo Gong or Tua Pek Kong. There are two important deities inside the temple namely, Guan Yin Goddess of Mercy and Da Bo Gong. It is believed by the local people that the former deity is the authority of conferring prosperity, making the sea calm, averting danger, and curing diseases. To memorialize a pious man Syed Abdul Rahman, his mother Nenek Ghalib and sister Puteri Fatimah three kramats or holy shrines were built at the top of the rocky mound on Kusu Island. To pray for good health, good marriage, wealth, and harmony many of the devotees climb upto the 152 steps leading to the kramats. Couples, who are childless, pray here with a strong belief of fulfilling their wish of getting a child. This island is famous for its tranquil settings, lagoons, and immaculate beaches. The tortoise sanctuary and wishing well attract the highest number of Visitors in this island. Here one can plan to arrange a picnic party in the afternoon. You must not miss to visit the tortoises' enclosure on Kusu Island. You can find two giant sized tortoises in the enclosure. But, none is allowed to stay overnight or for camping in this island.